“When you bring 42 teams together composed of over 650 student athletes and their coaching staff, playing a total of 105 games in three days, you have to ask yourself, ‘Are you insane?’ The answer is probably ‘yes,’ however, I would do it all over again,” says David Jardine, director of Student Activities & Athletics. 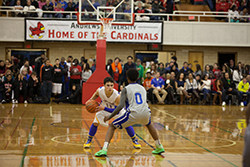 Andrews University hosted the annual Cardinal Classic Basketball Tournament Feb. 6–8, 2014, with a record number of 22 boys teams and 20 girls teams participating. Andrews welcomed more than 650 athletes, coaches and sponsors from all over the country to compete in the three-day event. The tournament allowed the academies to interact with each other and gave the students an opportunity to meet new people and make friends from other schools, as well as experience what life at Andrews is like. While the students spent most their time practicing and playing games, they also had the opportunity to tour the Andrews campus and attend vespers and church services in the Howard Performing Arts Center featuring speaker David Hall Sr., youth director of the Nevada-Utah Conference of Seventh-day Adventists. Despite the well-below-freezing temperatures, the athletes and academy staff seemed to enjoy their stay at Andrews immensely. For others, the highlight of the weekend was interacting with and meeting other Christian athletes. Awards were given to teams that had good attitudes throughout the weekend. The Sportsmanship award was won by Union Springs Academy for both its boys and girls teams who demonstrated teamwork and fairness during the games.